"When we grow in spiritual consciousness, we identify ourselves with all that is in the world, so there is no exploitation. It is ourselves we are helping. It is ourselves we are healing." 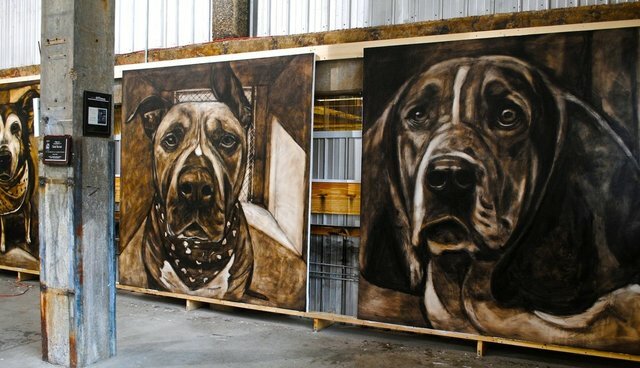 In addition to the 5500 12x12" portraits, there will be 11, 8x8ft paintings that represent the following areas: Puppy Mills, Dog Fighting, Abuse, Animal Testing, Shelter Negligence, BSL, Aggression Tests, Rescue Legislation, Killing for Space & CATS. There is also an 8x8ft of my dog of 21years, "Santina" and she will be the gatekeeper.